Double your donation at no additional cost to you! Now through Jan 5 (TWELFTH NIGHT) the next $4,500 donated will be matched! You can make your gift through DonorBox or Facebook or in-person and our anonymous donor has agreed to match funds to help us on our way to reach our $9,000 Giving Goal for Season 9! Stretch your dollars further and consider making a donation today! And remember as you enjoy your Amazon GiftCards or are just making your standard purchases that you can help us without spending any extra pennies. Just this holiday season we received our AmazonSmile link so now any purchase made using that link will automatically send a small percentage of the total to us - no cost to you! So shop away. Buy presents for yourself this season and we'll thank you for it! We are in full swing preparing readings, workshops, school visits, library story hours and of course Tour 9: Twelfth Night. This season our goal is to take you on an adventure without you ever having to leave your backyard. In order to do that though, we do need your help. Travel costs money, so while we don't want you to have to travel more than down the block, the transformation of your "backyard" into somewhere magical requires a few dollars and cents and also requires our company to travel to you. Our Season Nine Over-All Budget is an ambitious *$25,000, which when you look at what we're doing...is actually pretty small. We survive by being frugal and relying on a lot of in-kind donations (housing is huge - see more below). We have several grants that we are working on and many of our tour locations are able to provide stipends for us. We are so grateful to everyone working on this, but we still do need private donations to - quite literally - keep us moving. So we are trying to raise $9,000 for Season 9 from your generosity. If you are able to help with a donation, it means that we can keep visiting towns with small populations, schools with little or no arts budgets, neighborhoods where the community is hungry for art, but also hungry for food. We want everyone to feast, on Shakespeare and soup. Please donate today so that we can all feast together. Food Budget ($1,800): When we can we cook and eat family style. It is our preferred way of eating, so we don't have to spend a lot. Sometimes we do have to eat on the road, and while we pack sandwiches and snacks, sometimes eating out is needed (plus, then we get to support local businesses and your local economy, and sometimes even hang-out with you). Off-set Housing Budget ($900): During our residency in Southern Illinois we rely on amazing families who generously offer beds, showers and often great conversation, but sometimes we are on the road and haven't yet made friends with beds to spare, in those instances we find homes in hotels or through AirBnB, and while we aren't staying at the Four Seasons and we are frugal - sometimes beds cost money. ARTIST SALARIES ($6,300): Yes, we pay our artists, they are working 40 hours a week and are working away from home, they rehearse, they practice on their own, they become an inspirational crew of costumers, prop-makers, van-packers, sound designers, musicians and even help with some administrative duties and that's not even the performances; our artists help teach when we visit schools, are ambassadors for us, for Shakespeare and for theater. While they love the work, they have bills as do we all, and we don't want them to go into debt because of the work they are doing. Help us take care of our artists so that they can take care of you in your backyard and others in theirs. *Our total 2018-2019 budget is $25,000. We want to make sure you know how we are spending the money we raise, so below is a list of exactly how we have budgeted this year. If you would like your contribution to go to something specifically let us know and we will make sure it does. If you see that we need something below and you can help us in other ways (ex. you have a van to donate so we don't have to rent one), please e-mail us. It's help from you that makes it possible for us to d﻿iversify ﻿the cultural opportunities available to our Tour region. Like us on Facebook, follow us on Twitter and tell all your friends to do the same. If you know of communities that might be interested in us visiting them during our next season, please e-mail us at community@stonesoupshakespeare.com. Additionally we are looking for some volunteers to assist in capturing images, editing video and working on a very exciting poster project for our season. If you have experience in any of these areas, or have a quality digital video camera we can borrow (or if you are upgrading and are looking for a home for you old one) we would love to talk to you. We are working to maximize your donation dollars and match them with grant monies. Your help in anyway helps us as we move forward. Additionally this season we are in need of food, a guitar, earth friendly glitter, copying, a wooden crate and a wooden ladder...and a van (we're always on the hunt for a van). If you own any of this things and would be willing to let us borrow them for awhile, please e-mail info@stonesoupshakespeare.com. Remember not only are your cash gifts tax deductible, but certain items can be tax deductible too. Cash gifts can easily be donated online,* and other gifts can be donated by first e-mailing us (one more time send all thoughts to info@stonesoupshakespeare.com). *Stone Soup Shakespeare Theater is a registered 501(c)3 non-profit., a non-profit arts service organization. 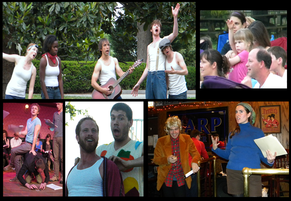 Contributions in behalf of Stone Soup Shakespeare are tax-deductible to the extent permitted by law.